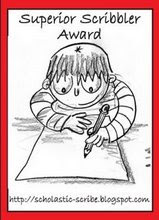 in addition to the dardos award I was recently given the superior scribbler blogging award. the mouse was bestowed this award by adam of I don't give 2 cents, I throw quarters. now adam is truly a superior scribbler and a self-described as a chronic blogger (I've got get get adam to explain what he means by this term 'chronic blogger', personally, if I was going to medicalize my blogging habit, I think I would prefer to think of myself as an acute blogger). in addition to having one of the best names for a blog, adam is a fellow denizen of cleveland and one terrific story teller. thanks adam! coincidentally, my other blog, the lakewood daily snap, also was graced with a superior scribbler award by the clever and always informative citizen k. (as a point of clarification for those who sometimes nibble on the lakewood daily snap, minerva mouse is in fact yours truly. minerva was born in order to maximize my photo storage capacity with blogger). coffee messiah who consistently serves up the best virtual cuppa java in the known universe. need a break? head over to cm's corner of the blogosphere, you will be glad you did! to colette of the whole ball of wax in a nutshell who openly and honestly writes about her quest to find meaning in life. thank you colette! gary's follow your bliss - gary is someone who really makes a difference in the world. I'm grateful that gary makes time to share the insights he gains as an teacher of young children. gary teaches in a public school in nyc which serves primarily children who are deaf or hard of hearing. gary's regular posts which he calls 'tips from my mom' never fails to inspire me- I guess we can say that gary comes by his wisdom quite naturally! all I need is everything , megan's corner of cyberspace is always welcoming and entertaining. however, given megan's joie de vie and loving spirit I feel that she actually has everything! you go girl! I'm so glad to have met you and I can't until our paths cross in terra firma - when we do I expect we'll engage in plenty of toasting and toast eating!! to avid reader at always reading I'm fairly new to always reading but fortunately always reading is a fairly new blog so I am thoroughly caught up. not only do I enjoy ar's scribbling on books, I love her inherent sense of whimsy. saretta an american expat who lives in molfetta italy. coincidentally I've learned saretta grew up not far from where my parents live. I hope if she comes for a visit she gives me a head's up I'd love to meet her in the flesh as it were! dido of the edinburgh daily photo. because of the scotland novels of alexander mccall smith, I have a deep desire to visit scotland, and particularly edinburgh. by reglularly visiting the edp, I can, thank goodness contain my wanderlust! junk thief in addition to sharing stories about life with the most elegant lady bow and giving occasional lessons on arcane moments of musical or cinematographic history, I count on junk to show pics of life in san francisco in general and the mission in particular. and last but not least to marc and his wonderful amsterdam daily photo. antoher place that is high on my list of places I want to visit! Each Superior Scribbler must in turn pass the Award on to 5 most-deserving Blog Friends. You must link to the author and name of the blog from where he/she has received the award. You must display the Award on your blog and link to THIS POST, which explains the Award. Each blogger who wins The Superior Scribbler Award must visit this post and add your name to the Mr. Linky List. That way, they will be able to keep up-to-date on everyone who receives this prestigious honor.You must post these rules on your blog. photo: emily dickenson rat by douglas max utter. for the last few years the st. clair development corporation has sponsored an annual public art project which celebrates the chinese new year. the organization is accepting proposals for the current year of the ox. based on last year's roll out of the rat sculptures, the ox sculptures should start hitting cleveland's streets in june. All you can really say about the Emily Dickinson Rat statue: wow! Will look forward to checking out your Scribbler picks. Ah, Natalie Merchant is the bomb! I've always loved her voice. and that is definitely a cool rat you have at the top of the post. A friend of mine in CO once sent me pictures of a Goose art festival they had in Boulder, with many whimsical sculptures of geese scattered all over the city. And RI used to have whimsical sculptures of Mr. Potato Head scattered around (Pawtucket, RI is the home of Hasbro Inc., and they created a children's hospital; the sculptures were commissioned to help fund the hospital). And haven't you been the busy little mouse, spreading awards all over the blogosphere? Hopefully this will be the first of more good news today! had a job interview yesterday...keeping me fingers crossed! in addition to cleveland's annual celebration of the chinese new year which brings forth animals from the chinese zodiac, cleveland is well sprinkled with sculptures of guitars - after all we are the rock and roll city! ca - best of luck....I will light a candle and a special stick of incense for you too!! Thank you very much for this honour, I really appreciate it and am so pleased that you are enjoying my blog!! Thanks for the discovery of Natalie Merchant. I realize your readers speak English but here's another tribute to Jack Kerouac, this one from Québécois singer Richard Séguin. It's called The Vagabond Angel and it's an old favorite of mine. Enjoy! Thank you, Kimy! That's awfully sweet of you. We will definitely have to get together on my next visit to the States. Although my parents have gone and moved to West Virginia, of all places! Thank you Kimy for the award but more especially for those kind words. Praise from someone you admire is extra-special primo good, and I admire the Mouse tremendously! But oh, no. MORE great blogs to read? Help me, Rhonda!!! Hi kimy and thank you very much for the award. It's really great to know that you appreciate my blog. Compliments like yours make it worth putting all the work into it. Thanks! thank you for the nice words!! chronic blogger. it depends on who you ask, but chronic is defined as: a persistent and lasting disease or medical condition, or one that has developed slowly. my blog habit started a few years ago on myspace, and has developed into a long lasting planning session between blogs. I may not write a blog everyday [although I have] my life in consumed with thinking about and writing blogs. It started as an outlet to write my thoughts, and once I got my first subscriber, I started to stop writing from the top of my head, and more about planning my writing. It started as a short google of a subject and now have developed into something much much more. I have a note pad that I write in, I have a voice recorder that I speak notes into. I get home and listen/read my notes and start to write. So using that definition of chronic, then I guess I would be a chronic blogger. I guess this is good considering I have been trying to actually write a novel, and I guess this is a good exercise. Your photographs are wonderful and like your words they make me think a little deeper about things than I would have otherwise. The statue is wonderful. Thanks for the capsule descriptions of the blogs...you are a wonderful appreciator. Thanks for your lovely comment on my Blog today! If you've got any tips for a newbie, please let me know. Your Blogs are awesome, I can see why they win awards. You’ve been given the You’ve Been Tagged Award. You can check it out at http://womenoverfifty.today.com/. If you don’t participate in blog tags and awards, I understand. No pressure to participate. thanks for all the great comments, I've been lax replying to comments of late - guess too much stuff going on these days. sorry, but I really appreciate the feedback!!! gary...looking forward to another one of ma's tips! e - k is a wonderful letter ....will be playing later this week. marilynn - I don't usually play the tagging things but will check out what's over at over 50.... thanks all the same! Thank you for the award, I'm sort of working on a post on awards that it would go well with it, ---well I'll put it on with that future post.